Now you can have frozen coffee any time. Follow the easy steps below and you’ll be sipping iced coffee in no time. 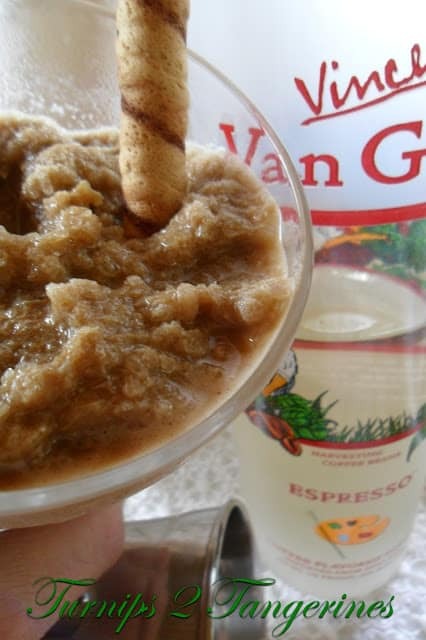 For an added special treat, add a shot or two of Van Gogh Espresso Vodka. 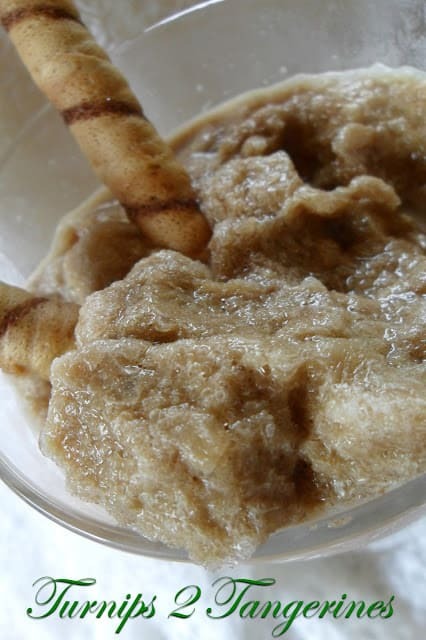 Frozen Coffee the Adult Version is a delicious and refreshing drink. The perfect drink to sip after a long day at work or on a hot summer evening at the lake. 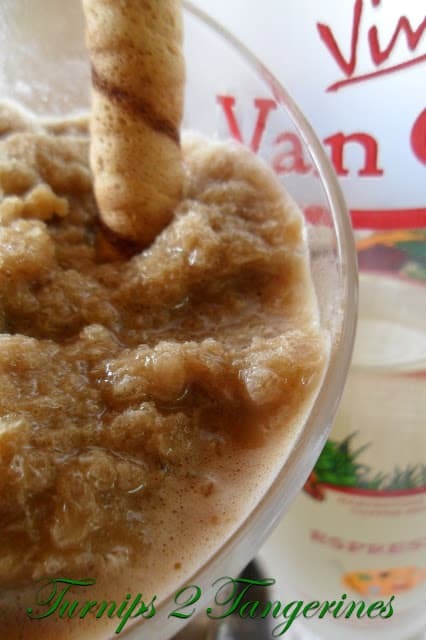 If you’re a fan of coffee, this delicious cocktail will become your favorite refreshing drink. Cool off with delicious, creamy and icy adult cocktail. Brew espresso in a regular coffee maker, using 4 tablespoons espresso and 12 cups water. When espresso is finished brewing, cool to room temperature. In clean 5 quart ice cream pail, pour the half gallon International Delight Iced Coffee. Add the cold brewed coffee. Pour in the 6 packages of sweetener/sugar substitute and stir. Place cover on pail and freeze. Freeze overnight or until mixture is frozen enough to scoop out. Stir until desired consistency, serve with a straw. For Non-Alcoholic version: leave out the Vodka. *Note: This is not a sponsored post. 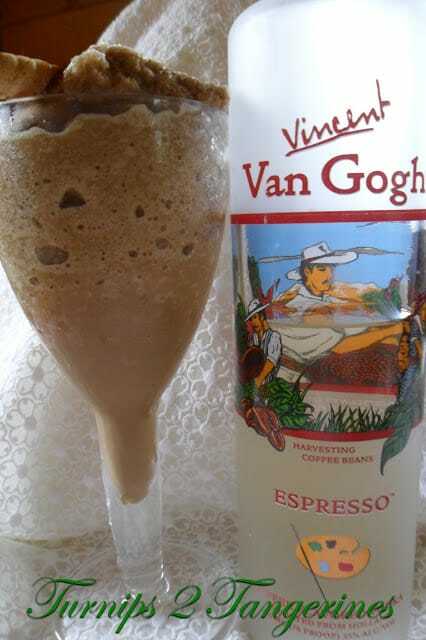 Here at Turnips 2 Tangerines we enjoy passing along to our readers “Food Finds” Van Gogh Vodka is one such food find. I would love to have one of these right now! It would probably keep m e up all night, but I know it would taste good! Hey, Lynn! I saw this yesterday and got interrupted before I could comment. Pinning…I love anything coffee. Thank you for linking this week! What a yummy fabulous idea!!!!!! I'm a total coffee addict and can't wait to try this. Yum yum!